Can the latest Surface Pro keep pace with the iPad Pro and laptop rivals like the MacBook Air? Microsoft hasn’t improved this year’s Surface Pro a great deal, but this is still the best 2-in-1 around. The question is whether you need a 2-in-1 or not; will you use it as a tablet? For many, a laptop remains a better option. The Surface Pro 6 is the latest version of Microsoft’s successful 2-in-1 tablet-PC combo. It’s been launched alongside the Surface Laptop 2, which is a more traditional clamshell laptop design like the MacBook Air. The new Surface Pro doesn’t have a stack of improvements over the last generation, but it does up the performance significantly; its closest direct comparable is probably the HP ZBook x2, although there are plenty of other 2-in-1 competitors like the Acer Switch 5. However, as a creative, the question is: is it as good a tablet as the iPad Pro or a potential laptop replacement that can take on your current ulra-portable? The short answer is that no, it’s not as good as a tablet as the iPad Pro. And it doesn’t do a good a job as a laptop as, well, being a laptop. Where the Surface Pro 6 wins is in its flexibility as a tablet, a laptop and a fully-powered Windows machine that you can dock with a keyboard and monitor when you get to a desk. Surface Pro 6 starts at £879 for the Core-i5, 8GB RAM and 128GB storage version and rises to a whopping £2,149 for the Core i7, 16GB RAM and 1TB storage version. You can only have 16GB with Core i7, which is a little annoying, so our pick is the Core-i5, 8GB RAM and 256GB storage version for £1,149. That said, there will no doubt be some savings to be made with Black Friday fast approaching. You also need to invest more to buy the Surface Pen (£100) and the specially designed detachable Surface Type Cover (£125) that attaches to the bottom edge of the Surface Pro with a special docking point. This is galling as both are really essential to the Surface Pro experience. But Microsoft isn’t alone here – with an iPad you have to buy everything separately after all. The £90 Surface Dial can be a compelling experience – see more on that on our Surface Studio review here – but while it’s compatible with Surface Pro, we feel it’s best suited to larger screens such as the Surface Studio or larger 15-inch Surface Book 2. The problem with the added extras is that, by the time you’ve added them on, you’re looking at the same price (or more) as an ultraportable laptop. The Surface Pro 6 features Microsoft’s specially-designed 12.3-inch PixelSense touchscreen display with a 2,736 x 1,824 – this gives you 267ppi, which is slightly more than the new iPad Pro. Microsoft has kept the same 3:2 screen from before; clearly it feels the resolution is high enough without impacting on battery life. The display is really very bright (although not the brightest in the market at around 400nits and not as bright as the iPad Pro) while colours are punchy. It’s actually great for watching video on – if you’re after a device to use at home as well as for work, there are few with a display as good as this. Two colour profiles are available; Enhanced and sRGB. The latter profile will give you more accurate colours but comes with the loss of some contrast. Enhanced is the default mode so you’ll get more punchy colours and improved contrast but skin tones are left alone. As a touchscreen display, it’s extremely accurate. Windows 10 features a tablet mode to make using the touchscreen more accessible, but it is possible to use the standard desktop with touch. It’s up to you. Tablet Mode does require a little refinement and it isn’t a patch on iOS as a tablet operating system, but it does mean you don’t have to switch devices when you want to switch from laptop mode to tablet mode. The Surface Pen is an essential accessory and works fantastically well as a device to both negotiate the desktop and use with Windows Ink, Office apps like OneNote and Adobe Acrobat. Previous versions of the Surface Pro have disappointed in the battery life stakes; they certainly weren’t able to last all day. This version does appear to turn a corner and we found we could get around eight hours of constant use. We’ve seen some tests that put it around nine hours, but we found this to be unrealistic. The Surface Pro 6 sticks with the familiar Surface Pro design with a chunky bezel around the display and the unique kickstand at the rear. As well as the usual platinum finish, this year’s model is available in the sleek black finish you can see in the pictures here. The design could do with a refresh – especially when considering those thick bezels – although the kickstand is one of the best around. When attached, the keyboard turns the device into a near-laptop, providing you can put it on a desk or table – it’s nowhere near as rigid or useful as a laptop if you need to work with it on your lap (an ergonomic nightmare at the best of times) or a tray table on an airplane or train. If you often work in these scenarios we really would recommend a laptop instead. In terms of ports, the Surface Pro 6 sticks with single DisplayPort and old-style USB-A ports instead of USB-C, while there’s a microSD slot under the kickstand. There’s also the same proprietary Surface Connect port for charging as before. Really this device should have USB-C, and Microsoft is risking it by not including it here. With all Macs now being USB-C-based – not to mention the new iPad Pro and many other 2-in-1s and other ultraportable devices – Surface Pro 6 now looks off the pace in this regard. And that’s a big pity for such a high-end device. It should have two USB-C ports and incorporate USB-C charging, too. Even the lower-end Surface Go features a USB-C port. There are also two cameras – a rear 8 megapixel unit and a front-facing 5 megapixel video-calling camera. Both are capable of 1080p HD video and you can also use the front-facing camera for Windows Hello face recognition to unlock the device with your face. This is pretty effective, though. The Surface Go 6 is a very powerful 2-in-1 device and remains the best hybrid laptop-tablet for most people. It’s not as powerful as the Surface Book 2, it’s not as good a tablet as the iPad Pro and it’s not as good as being a laptop as a laptop. It also needs a design refinement and a move to USB-C. And, while we’re going big with the criticism, pricing can get expensive once you add the essential accessories. 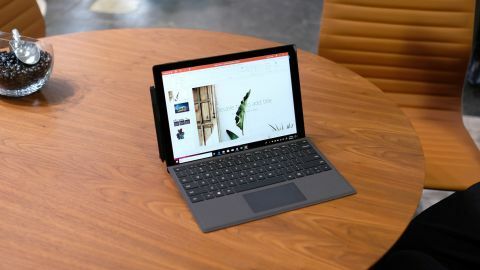 But it’s easy to overlook all that because Surface Pro 6 is an extremely flexible, do-anything device that can be your constant companion, especially if you want a Windows 10 PC you can use with the excellent Surface Pen.